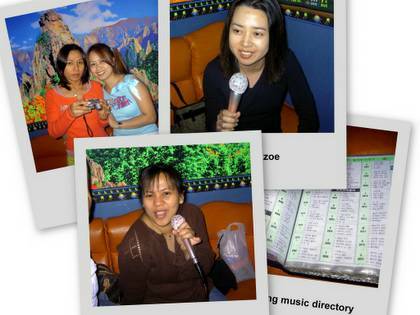 A favorite place to spend time with friends and family is the “noraebang” (ë…¸ëž˜ – song ë°© – room), which is similar to the KTV’s one can find in the happening places of Manila and other cities in the Philippines. In Korea, there’s one in almost every city street specially here in Seoul. Rates are on an hourly basis, about 20,000 KRW ($20) with free cans of soda. There are thousands of songs to choose from in the thick music directory. Majority of the songs are in Korean and some English but if you’re lucky, you can find Chinese, Vietnamese and Filipino songs as well. Surprisingly, you can find Freddie Aguilar’s world famous song “Anak” in the English song directory. It was a very popular song and a lot of Koreans in their 40’s recognize it. My husband even thought that it’s originally a Korean song. It’s better to go to the noraebang that the younger generation patronizes. Visiting Korea wouldn’t be complete without dropping by to this place. They’re not really expensive plus it’s guaranteed fun for the whole gang. After an hour of singing and belting out to songs, you are usually given extra minutes between 15 to 20. They call it “service” or more like freebie. So here we are singing our hearts out to familiar songs. And no, I don’t really sing. I’m probably one of the few Filipinos who can’t. I love to sing but ~ at least my friends make the money we pay for the noraebang worthy. I don’t know if it also happens in Seoul, but in my place, when there are few customers, they just reset and reset the clock. So even if you pay for only one hour, you end up singing for 2 hours or even longer. excuse me…at first pala yun.